Just want to get this going in case someone, well, goes. I'm excited for McGee's tiki mastery outside of Three Dot's overwhelming bro-vironment. 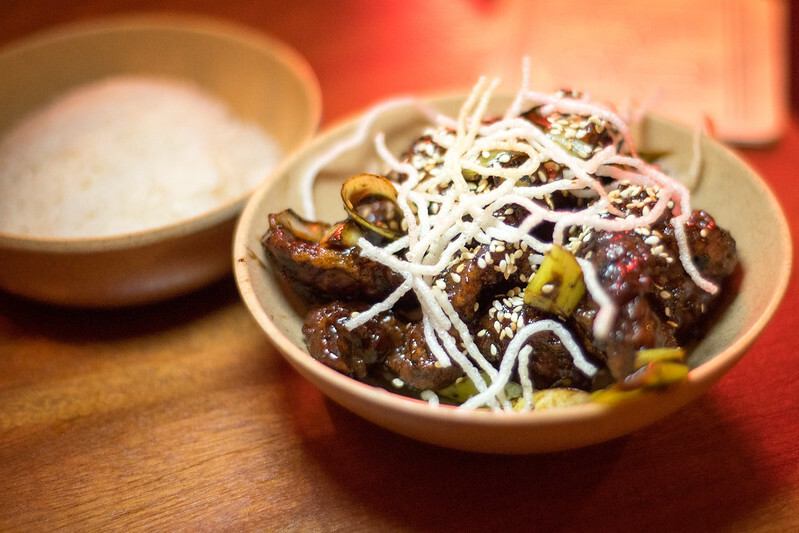 Drinks are strong, food is delicious, vibe is great. Apologies that I can't offer the names of anything. Wish I could have had about 8 more drinks, but it's a weeknight and they are stroooong. Food was a perfect pairing. Will be going again and again. Was there earlier on Wednesday myself and had also been for F&F (so I may be a bit biased) but I absolutely love it. Very nice space, fantastic drinks, tasty food. The vibe is, I'm guessing, what Paul originally intended for 3 Dots. It's era-specific. And . . . great shots, Nick! Really beautiful! There must be a backstory of some sort to the name "Lost Lake." When I first saw it I was thinking northwoods fish fry/prime rib, supper club. I am sure that there are lakes in Polynesia, but that's not my first association. The place we go to for Friday fish fry up north is Lost Land Lake Lodge. To me the name sounds more like Vilas than Vanuatu. 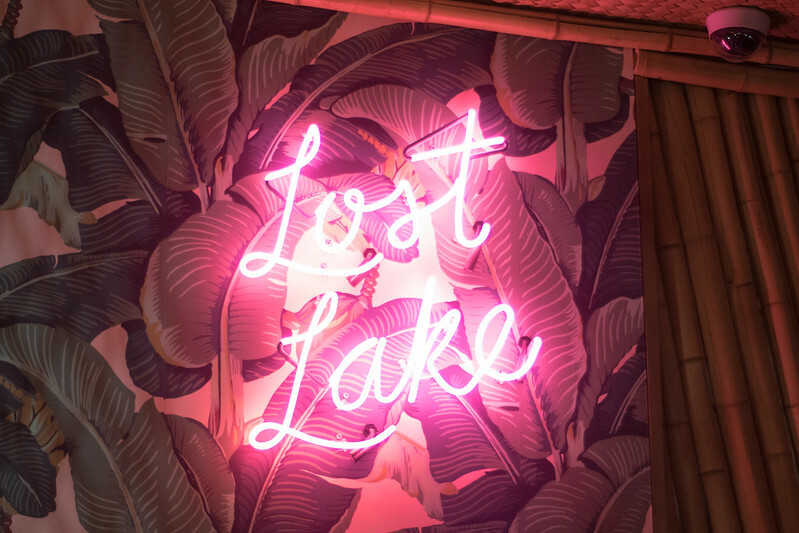 From the Time Out preview: "The name Lost Lake is from a friend of McGee’s, who named an old tiki drink he made at the Whistler for a place she had been to in Oregon." Vitesse98 wrote: From the Time Out preview: "The name Lost Lake is from a friend of McGee’s, who named an old tiki drink he made at the Whistler for a place she had been to in Oregon." Can't wait to check this place out. I thought this name sounded familiar, so I looked it up. There is a Lost Lake near Mount Hood that is perhaps the best known, but in (Wikipedia) fact, Oregon has 19 lakes named Lost Lake. Since the lakes don't actually move, I suspect this means that hikers in Oregon get lost a lot. I've visited Lost Lake several times now and just wanted to toss in my thoughts that it is indeed wonderfully executed and well thought out. The comparisons to Three Dots will be inevitable but you should try not to do that... Lost Lake is not Three Dots and is not trying to be Three Dots and despite certain obvious similarities they are otherwise quite different and live in very different neighborhoods. Lost lake deserves recognition on it's own. Its menu is great (both the drinks but also the physical menu itself, which is always a signal to me about how much a place cares about what they are doing... Lost Lake cares a lot!). There are a couple of carry overs of drinks from Three Dots but otherwise it is an all-new menu and I have to say... shockingly, I think it is better than ever. Paul has a couple of original classic drinks that I was not familiar with and a bunch of really creative and exciting originals.... I have had most of the menu now and they are really outstanding. But the single most important factor to me is the people who work there. The staff truly makes all the difference at any establishment but especially one such as Lost Lake. This is in part because it is very popular and therefore a staff that can handle the situation is vital but more so because the menu is full of drinks that most people will be clueless about. Here the staff is friendly, knowledgeable and kind. They will walk you through it and make spot on recommendations. This comes from the leadership on down and they are doing it right at lost lake. I have no negatives other than it is certainly successful and therefore crowded... it is not a large space so it fills up quickly and stays filled; the up side to the crowds is that the clientele tends to be very friendly and laid back. It's a great place and I'll be back many times I am sure. Last edited by Teevtee on January 24th, 2015, 4:56 pm, edited 1 time in total. Teevtee wrote: it is not a large space so it fills up quickly and stays filled; the up side to the crowds is that the clientele tends to be very friendly and laid. I was going to wait for this place to calm down a bit before I tried to go there but now I might have to change my plans. Yes they are likely laid as well... btu I meant to say "Laid back"... post as been edited. Even though when I went it was absurdly crowded, the staff managed everything great. Truly the mark of good staff and management. Only complaint: no coat hooks that I could find anywhere. mgmcewen wrote: Only complaint: no coat hooks that I could find anywhere. There are purse/coat hooks under the bar. Still havnt made it in yet. Considering going with a group of 6 on Sunday the 15th. We went last night and really enjoyed ourselves. Even though it kept one of our latecomers to our table stranded outside for a bit, the "one in, one out" policy is sensible and makes LL quite laid back and relaxed once you get in. Clientele is suitably laid back and a big plus for me compared to Three Dots. Drinks were tasty. I enjoyed the Lost Lake a bit more than some of the other more juice-focused drinks. Highlight of the night was a Smith & Cross Old-Fashioned, which was stunning. I would like to put a plug in for Lost Lake's Daily Daiquiri. It's an basic, classic daiquiri that uses a different rum each day for $8. As a person who is learning about rum, this is a great way to try new ones. Giallo wrote: I would like to put a plug in for Lost Lake's Daily Daiquiri. It's an basic, classic daiquiri that uses a different rum each day for $8. As a person who is learning about rum, this is a great way to try new ones. That's a great idea. And how cool would it be to have a daiquiri flight? I can speak from experience, it is very cool! I'm always surprised by how polarizing American Chinese food is. 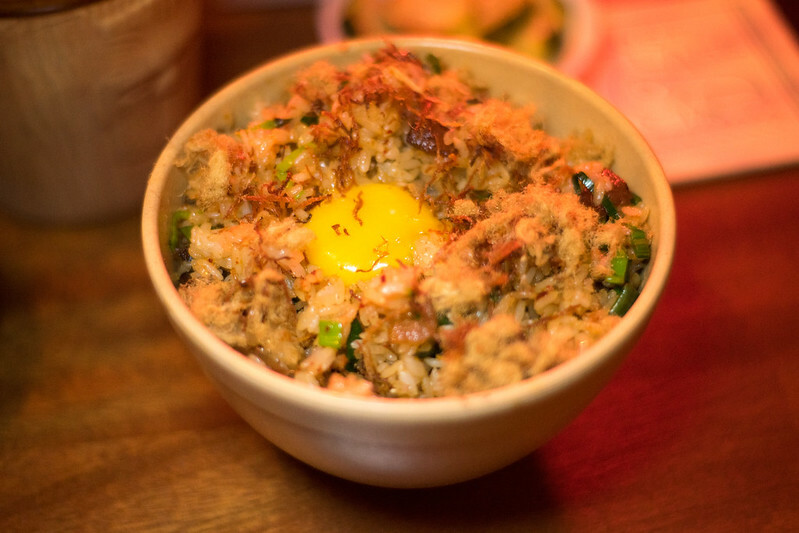 Somehow jews, second generation Chinese Americans, and discerning foodies each have their own unique relationship with it. Having grown up in the heart of Chinese expat community in LA, I never had occasion to try it out. For context, I had to google what 'General Tso Chicken' actually is (it's on the menu) since I've never had it before. Charred Cabbage Salad - Highly recommended. The sweet bitterness of the ginger played well with the charred edges of the cabbage. 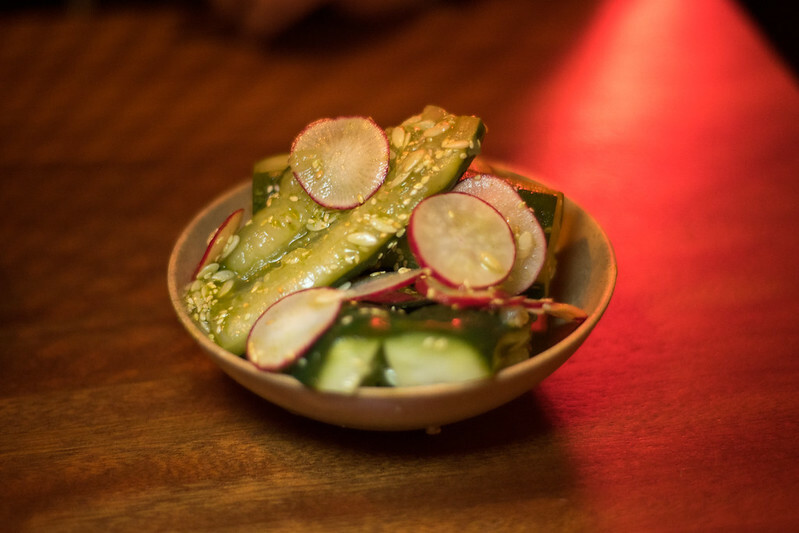 It was also infinitely less oily than any comparable preparations of napa cabbage. Xian Bing Chinese Hand Pie - For the longest time, I couldn't understand how people could not like tofu. It's so smooth and flavorful and is such a great transporter of sauces. I think I understand after trying this hand pie with tofu - hard, flavorless, tiny strips of tofu in a thick doughy bun - like a matzo ball without any salt, stock, or fat. 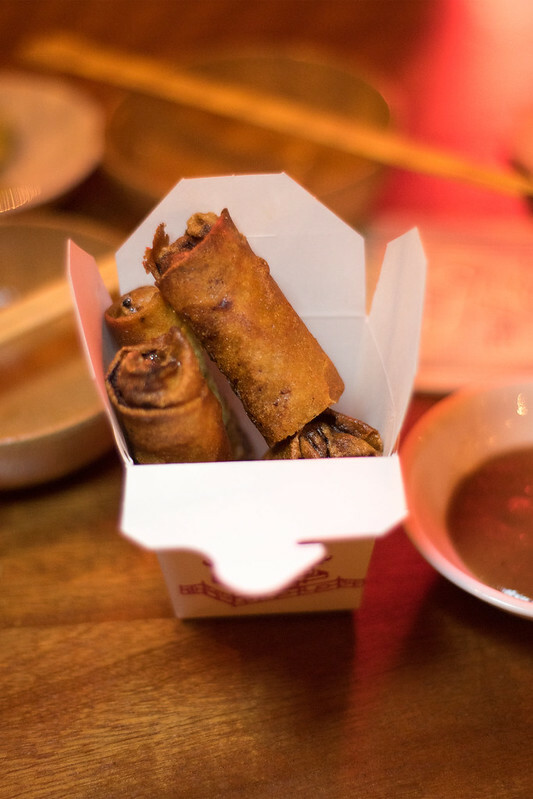 Thank You Eggrolls - 'Fermented' is one of those buzzwords that excite the adventurous eater. So do try to sympathize how disappointed I was when my order came out to be 2 anemic eggrolls with the most boring vegetables strips inside and perhaps just drops of rice vinegar to "ferment" the vegetables. Chicken Wings - Bang Bang option - These were great! 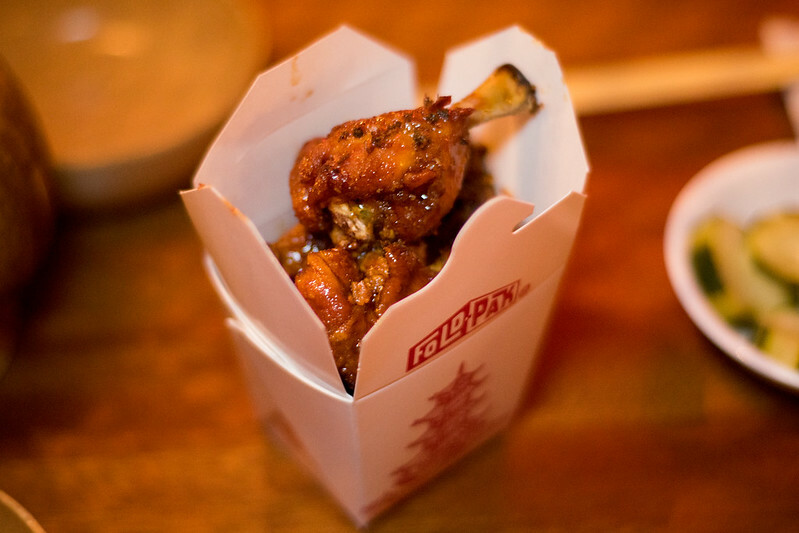 On my way home I could smell the Szechuan peppercorns and chili oil from the wings. It wasn't at its crispiest by the time I got to them, but the flavor complexity wouldn't have been out of place at any specialized Szechuan restaurant. Packs a good amount of heat too. nice report, bernard. i havent been yet, but i'll certainly avoid ordering the chinese hand pie: i wouldnt want to eat something described as a 'matzo ball without any salt, stock or fat' !!! won the IMBIBE honor of THE BEST Cocktail Lounge in The US for 2015. What have Saturday night crowds been like this season? If you get there really early, is it still a long wait? Or does it just get busier as the night goes on? We went there on Valentine's Day, despite expecting it to be crowded for the occasion, even though it was a Sunday. We did not have to wait long for a table, though. Our server told us they do get slammed on Friday and Saturday nights, so we'll keep that in mind when planning our next visit. We had the "Some Days Last A Long Time" (Scotch whisky, sherry, coconut, lemon, absinthe) and the "Bunny's Banana Daiquiri" (overproof Jamaican rum, overproof demerara rum, spiced rum, banana, coconut, lime, complete with unpeeled banana garnish cut to look like a dolphin with a beach ball in its mouth). We thoroughly enjoyed them both. Mine (Some Days Last a Long Time) reminded me vaguely and pleasantly of an old-fashioned. Since I like gin, I wonder if my choice the next time I'm there should be the " Heaven Is A Place/This Is The Place" (London dry gin, lime, curaçao, falernum, honey, allspice, angostura bitters). Despite the cold outside, we loved how icy cold the ceramic drink glasses were. 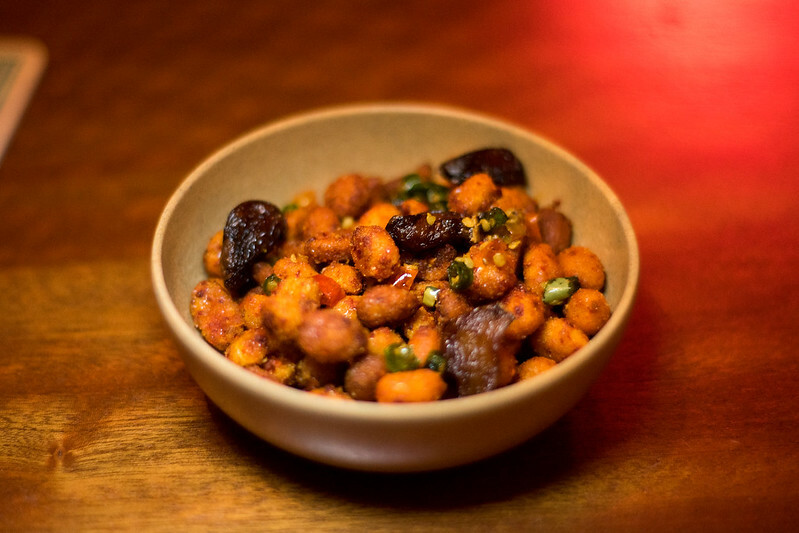 I think it's great that you can get Chinese food as bar snacks --- I don't like to drink on an empty stomach. I enjoyed a shrimp egg roll and we shared ... hmm, I'm not seeing it on the menu, but I thought we had something calamari-ish ... maybe it was a daily special or maybe the strength of the drink made me forget. We also had some dumplings that we did not enjoy as much; it might have been because of the cumin in them. But that's a minor quibble; I would gladly go back and try my next drink there with some other items on the food menu. We sat in the corner right next to the neon Lost Lake sign and enjoyed the warm and friendly atmosphere of the place. We also enjoyed hearing from our server about the various family connections of the people working there, although I don't remember the details well. I saw today that Lost Lake is a semifinalist for a 2016 James Beard Award for outstanding bar program. bw77 wrote: To me the name sounds more like Vilas than Vanuatu. grew up going to St Germain (Vilas county) and still do frequently. I thought the same thing. Katie wrote: Our server told us they do get slammed on Friday and Saturday nights, so we'll keep that in mind when planning our next visit. Mrs Willie & I went last night (Saturday evening), showed up about 8pm, we were let right in, no line, after about 20 minutes two seats opened up at the bar. That said, we overheard others saying that earlier in the evening they had to wait 15-20 minutes to get in and when we left, there was a line of about 15 people waiting to get in. mgmcewen wrote: Even though when I went it was absurdly crowded, the staff managed everything great. Truly the mark of good staff and management. the staff was spot on last night as well despite the place being packed. The bartenders actually were interested in taking orders from others not seated at the bar something I find lacking at many bars. I always appreciate that as well as practiced it when tending bar, taking care of those seated at the bar but always on the lookout for those wanting a drink, keep 'em happy & drinks their hands. 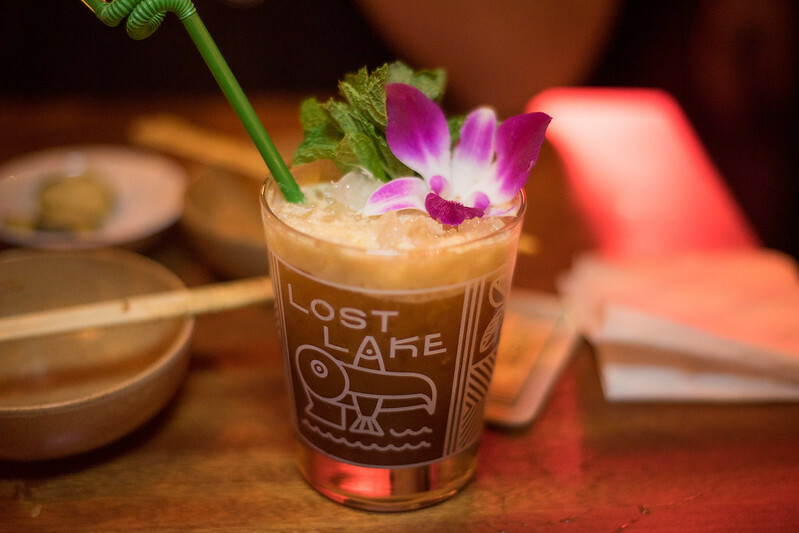 I was pleasantly surprised to come across a mention of Lost Lake in a Guardian article about 2017 drink trends, one of which, happily, is predicted to be tiki drinks. 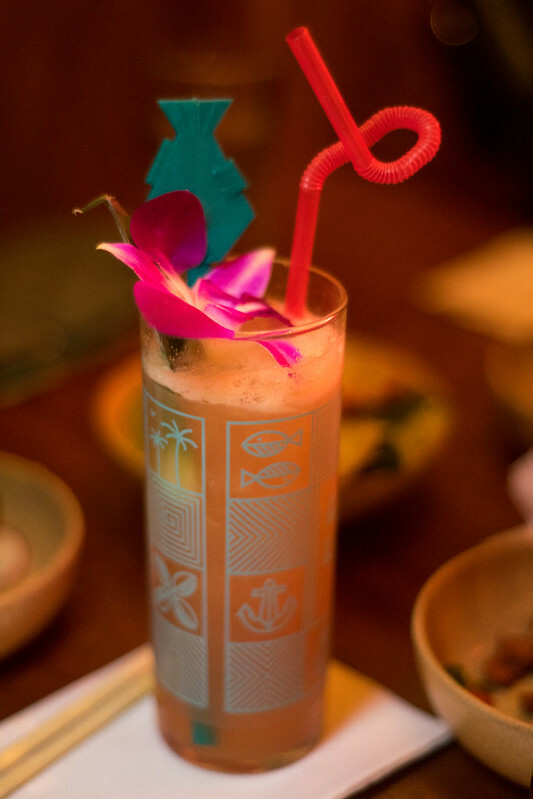 Katie wrote: I was pleasantly surprised to come across a mention of Lost Lake in a Guardian article about 2017 drink trends, one of which, happily, is predicted to be tiki drinks. 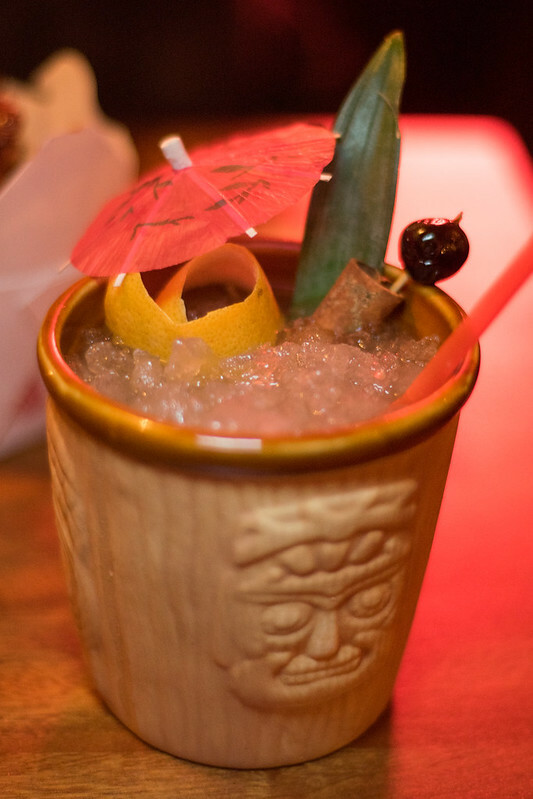 Lost Lake is arguably the best place in the U.S. (or even the world) to enjoy the craft of Tiki. And we're damned lucky to have it here in Chicago. I was there a couple of weeks ago and, as usual, picked up some excellent knowledge while I enjoyed my libations. But The Guardian is a couple years off, imo. Tiki was trending full-force in 2015. I think the focus on spirits is elsewhere now . . . and not necessarily in any of the areas mentioned in their piece. Any word on kitchen return? No idea but as I'm guessing you know, it's still boarded up. I'll try to remember to ask next time I'm in there.